The Turkish-backed Sham Legion, a member of the Free Syrian Army, published these photos on its social media accounts in August 2016. The screenshots show various munitions captured from Kurdish YPG fighters of Syrian Democratic Forces near Jarabulus in Northern Syria. Former US President Obama vowed not to arm Kurdish groups in Syria to appease Turkey, but reporters have traced Serbian mortar shells purchased by the Pentagon to a banned militia. Serbia’s Ministry of Trade and the state-owned ammunition producer Krusik have revealed that mortars found with a Kurdish militia in Syria were from a batch sold, almost in its entirety, to the Pentagon’s Special Operations Command, SOCOM. SOCOM, which is responsible for securing weapons for US-backed rebels fighting ISIS in Syria, has denied buying the mortar shells despite being presented with statements from Krusik and the Serbian ministry, as well as leaked Pentagon shipping documents, which support the claim. The revelation appears to confirm that Kurdish militia in Syria were getting their hands on ammunition purchased by the US long before US President Donald Trump decided in May to lift a ban on arming them. It is not clear how the Kurdish People’s Protection Units, known as the YPG, which forms a key part of the Pentagon-backed, anti-ISIS group called the Syrian Democratic Forces, SDF, received the mortars back in 2016. Former US President Barack Obama had repeatedly vowed that only Arab units of the SDF would receive equipment in order to appease NATO-ally Turkey, which brands the YPG a terrorist organisation. A leaked end user certificate revealing the transfer of 4,000 mortar shells from Serbia to SOCOM headquarters in Kuwait. The data matches information provided by Serbia’s Ministry of Trade and Krusik related to lot KV 01/15. In August 2016, a Turkish-backed rebel group called Sham Legion advanced on the YPG in northern Syria near the Turkish border, seizing piles of Kalashnikovs and ammunition. Photos of the haul analysed by the Balkan Investigative Reporting Network, BIRN, and the Organized Crime and Corruption Reporting Project, OCCRP, revealed several packages of Serbian 120mm mortar rounds. The ammunition was marked with the lot number “KV 01/15” which was clearly visible on the packaging in the released photos. The ID number is not unique but indicates it is part of the first batch of shells produced in 2015 by the state-owned Krusik ammunition factory in Valjevo, western Serbia. 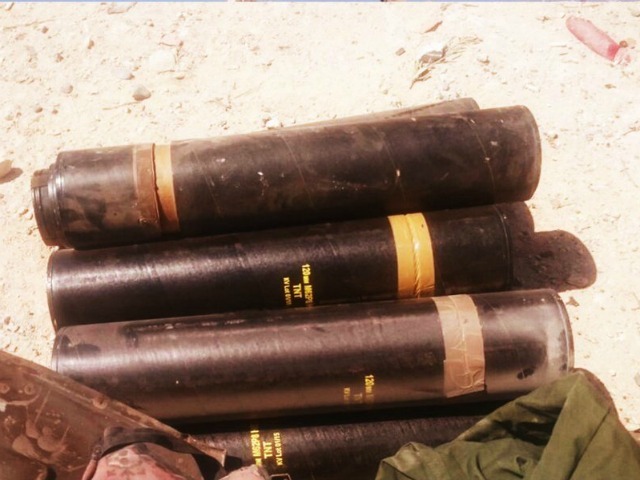 Serbia’s Ministry of Trade told BIRN and OCCRP the 8,860 mortar shells from “lot KV-01/15” had been delivered to Cameroon and Saudi Arabia – neither of which have backed Kurdish rebels in Syria – and SOCOM’s US base in Kuwait, a major logistical base for the Pentagon’s programme to arm Syrian rebels. It declined to say how many mortars went to each destination but added the shipment to Kuwait was made via an unnamed US firm. Krusik added in a statement that 602 shells were exported to Cameroon and 270 shells to Saudi Arabia, while the remaining 7,988 were sold to Yugoimport, the Serbian state-owned arms broker, in batches of 4,000; 3,938 and 50. It, however, would not reveal their final destination. The two official statements indicate the full 7,988 shells were transferred to SOCOM in Kuwait, but the ministry, Krusik and Yugoimport declined to confirm this. Further evidence of the transfer is provided, however, through Azerbaijani Silk Way air cargo documents leaked online in June. These reveal that in February 2016, 4,000 mortars of the exact type found in Syria were delivered to SOCOM in Kuwait through Yugoimport via US companies Chemring Military Products and UDC USA Inc. Given the absence of lot numbers in the shipping documents, and a lack of confirmation from the firms and authorities involved, it is impossible to state definitively that this delivery relates to the mortars found with Kurds in Syria, although the dates and figures tally with information provided by Serbia authorities. 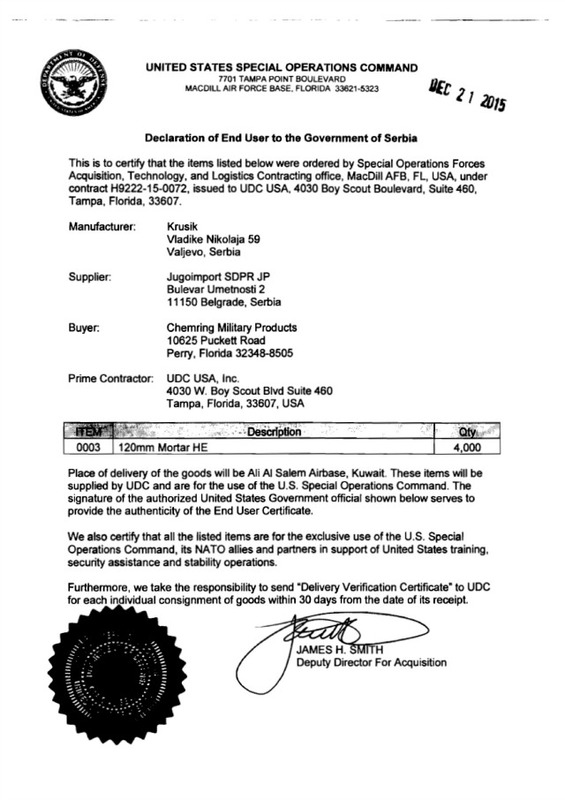 SOCOM said in a written statement that it had not bought mortars from this batch, but did not respond to requests for clarification when challenged with official information from Serbia.